Daniel and Ashley Adopt: Bill Cosby! Wicked!! Friends!!! This last week has been busy and fun! We launched a t-shirt sale to help with money for the agency costs. That took courage! It's slow going, but we hope it will work. On Tuesday Daniel called me at work and asked if I wanted to go see Bill Cosby live. Of course! I love Bill Cosby! His company had helped sponsor a second night for the event and had a few tickets. We got to go for Free! We had a good time. We picked up BBQ and ate it on the grass while waiting for it to start. Then on Wednesday night my mom and I went and saw Wicked! I loved it. I love the music, the costumes were wild and creative and I love seeing things live. We really enjoyed ourselves. We grabbed dinner at Blue Lemon in City Creek then walked to the theater. Then, on Saturday we went with a group of friends up to the Brigham City Temple and did a session followed by dinner at Maddox. 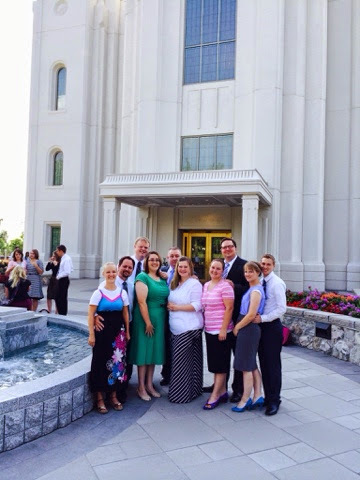 We were too busy enjoying dinner to grab a picture, but we got one at the temple. We have such great friends. Did you do anything fun this week? Such a fantastic week last week!